PRIVACY NOTICE: Warning – any person and/or institution and/or Agent and/or Agency of any governmental structure including but not limited to the United States Federal Government also using or monitoring/using this website or any of its associated websites, you do NOT have my permission to utilize any of my profile information nor any of the content contained herein including, but not limited to my photos, and/or the comments made about my photos or any other “picture” art posted on my profile. You are hereby notified that you are strictly prohibited from disclosing, copying, distributing, disseminating, or taking any other action against me with regard to this profile and the contents herein. The foregoing prohibitions also apply to your employee, agent, student or any personnel under your direction or control. In typical Jennifer fashion I posted my own status update, something along the lines of “that Facebook privacy thing is stupid and meaningless so stop.” It is stupid, after all. The enforceability of the UCC – which is a model code, and therefore only law insofar as it’s been enacted in any given state – against the federal government for privacy violations is questionable, to put it mildly. There is this thing called sovereign immunity. The fact that this dumb little statement claims to be necessary because Facebook is now publicly traded is laughable. And, of course, there’s the fact that if you post something and people can see it, you have no privacy rights in it anyway. Oh, and if it’s privacy you’re concerned about, you can’t go wrong with the Fourth Amendment to the United States Constitution. That’s going to get you a bit more bang for the buck than the UCC and you don’t have to post anything to invoke it. As an American you’re born into its protective cradle of privacy-ness. Sure, the Patriot Act is eroding that, but do you honestly think that your Facebook post will successfully go mano a mano with an anti-terrorism statute? You haven’t thought this thing through. But while putting these comments together is cathartic – really, America, are you this gullible now? – it’s not my point. I have been noticing a trend towards this sort of silly language on social media and elsewhere for a while now. A few months ago I had the distinct pleasure of dealing with a real, honest-to-God Freeman on the Land. If you haven’t heard of this organization, my friend, you are in for a Google-ific treat. Go ahead, I’ll wait. Well? Laugh much? Freemen on the Land believe for some reason that certain statements, words and phrases carry not just significance, but magical significance. Maybe this derives from their belief that they can opt out of complying with statutes. (Freemen think that statutory law only applies to people who consent to be governed, and that they need only comply with common law, which they seem to confuse with what philosophers call natural law. It’s a slightly more sophisticated twist on anarchy and the notion of the social contract.) 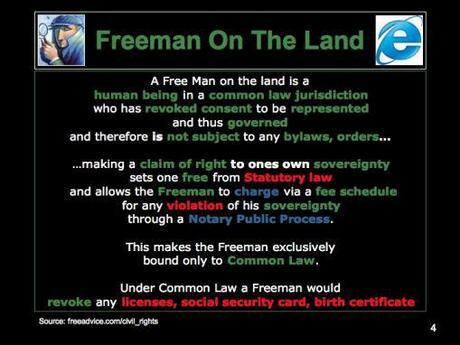 My particular Freeman kept filing pleadings in which his name appeared in all capitals, which I have come to understand has something to do with a weird notion that every person is simultaneously an individual and a corporation, and that certain laws affect only the corporation/person. It’s all very nonsensical, although I suspect I’ll be getting emails from crackpots for a while after I post this attempting to explain why it all makes perfect sense to anyone who doesn’t drink the Big Government Kool Aid. Sigh. Freemen seem to be gaining popularity in the United Kingdom, home of Thomas Hobbes and John Locke, who must be turning cartwheels in their graves. There the movement has become a basis for the disgruntled to refuse to pay taxes or civil fines, or to comply with family court orders. The notion is sad, since if these people actually understood the history of the common law they claim to prefer, they’d recognize that they have far more freedom now than when the King would travel from place to place, dispensing justice according to the law which was held “in common” by those villages. The common law has always recognized the power of the government to rule. Those who attempted to withdraw their consent to Tudor governance were quickly and efficiently beheaded. I do wonder at the talismanic quality of all this language. To me it reflects a very basic naïveté about how law and government work. The idea that writing “no contract” on a legal paper somehow renders the underlying law ineffective seems Harry Potter-esque, doesn’t it? Wave your wand, mutter some Latinate phrase, and voila! No obligation to pay your taxes. But the law doesn’t work that way, and neither does the social contract. And if you’re not willing to learn how the law actually works, at least check out Snopes.com before you post any more of this silliness. Want to Know How to Start a Business? What’s Keeping You From Starting Your Business?